In this guide I will show you how to change the Terms of your hosting plan in AMP (Account Management Panel). For example, you may want to pay every 2 years instead of on a yearly billing cycle. You will also be able to see your price listed, before making the change. This can help you decide which term works best for your needs. If you want to change the Hosting Plan you are subscribed to, see our guide on upgrading/downgrading your plan. Find the hosting plan you want to modify, and click the Change Hosting Plan button. To the right of the Select term option, click the drop-down box. You will see a list of available terms, along with a prorated price. Select the option that you want to change to. Next to Payment Method choose if you want to pay with Credit Card, or Check, then fill in information as needed. Click the SUBMIT button when you are done. You will finally see a message stating "Your order has been submitted for processing. Please look for a follow up from our staff shortly." Congratulations, now you know how to change the Terms of your hosting subscription in AMP! I would like to end your services. How do I get you to stop billing me automatically? I followed this tutorial to change my hosting plan and term but nothing happens when I click the Change Hosting Plan button. It just return to the same screen and does not bring up the options as shown in this example. Thank you for contacting us. Sorry to hear you are having trouble changing your hosting plan. I recommend contacting our live Account and Billing team, so they can make the change for you and test our AMP further. I'm currently paying for my web hosting package every 6 months. I'd like to find out if there's an annual payment plan, or even a 2 or 3-year plan that I can pay ahead? Yes, we have 1, 2 and 3 year plans available. You will want to contact our Live Billing team for specifics. Ihave purchased hosting and associated it with one name (original domain name I bought and am now not using), but wish to use another one instead. How can I change the name given to the account? if this isn't possible. Is the add on domain, completely separate. Ie can it be set up as a separate independent site? So in effect the add on domain is my main hosted site. You can request a change of the main domain in the Account Management Panel (AMP). Add-on domains are considered separate websites. The main difference is that the website files are kept in a folder under the primary domain. However, when the add-on domain is accessed over the internet, it appears a stand-alone domain. I hope that helps to answer your questions. so should i select change plan and then slect PRO again but for 1 year? and can i renew it with PRO for 2 years? If it offers you the chance to change the term when updating, you should be able to select 1 year. If you do not see that ability, you can always contact the Live Billing team via chat and they will be able to assist you there. This doc needs to be updated to be more clear. I followed each step to a tee and it invoked a change from my VPS to a Launch Plan. 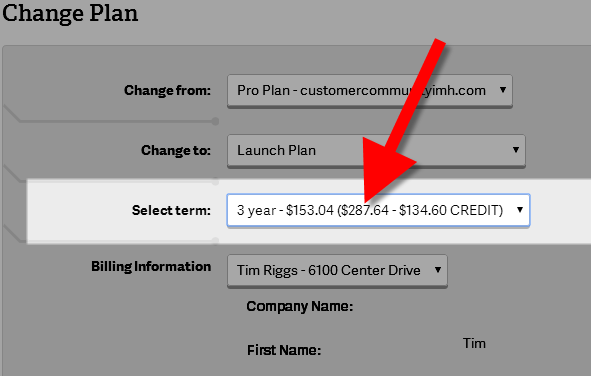 You should really mention that the "change to" field needs to reflect the same plan because the dropdown defaults to Launch Plan. I spent unecessary time on a service call that could have been avoided if this doc was more clear. A downgrade would have potentially hurt my business and waisted my time and your server teams time making the unecessary change. Thank you. Thank you for your input. I will add this article to our list that needs to be updated as our system does change often. This doc still needs an update; although I could figure I had to choose the same plan in the Cahnge to field; it will be nicer to have the form laid out more simply, say 2 buttons; change plan term and change plan type, you select and a dedicated form opens for the process. Wish to change plan from elite dedicated to VPS, will there be a set up fee for this or will be taken care of under the new plan fees? Typically, when you downgrade from a dedicated server to a VPS, there is a required review from the systems department, and then billing will make the change once the downgrade is approved. The fees are typically covered in the downgrade. If you have any questions, please contact our customer service department. When upgrading hosting plans from VPS to dedicated server, will the migration of existing domains, websites, etc. be done for me? Yes, if you upgrade to a dedicated server from a VPS, they will migrate the files and websites to the new server. Everything that was running on the VPS would be running on the dedicated server. The autorenew is a mandatory part of the subscription to the service that you have signed up. The only way to remove it would be to request that the subscription be set to expire. The danger here is if you do NOT intend to leave InMotion, then if the subscription were to expire, your website would not be available until you renewed the service. Autorenew allows the account to automatically renew the subscription. If removing the autorenew is an absolute necessity, then you will need to submit a verified ticket or contact the Billing department to have your account set to expire. I hope this helps to answer your question, please let us know if you require any further assistance.